The Export Bitmap window lets you export a storyboard project to bitmap files in .jpg, .tga, .psd or .png format. The exported data includes a separate bitmap file for each panel in the storyboard. NOTE For .psd files, the transform and transition animations are not exported. However, camera moves are rendered into an independent layer. NOTE See Export Bitmap Dialog Box for more information about the options. Select File > Export > Bitmap. The Export to Bitmap dialog box opens. 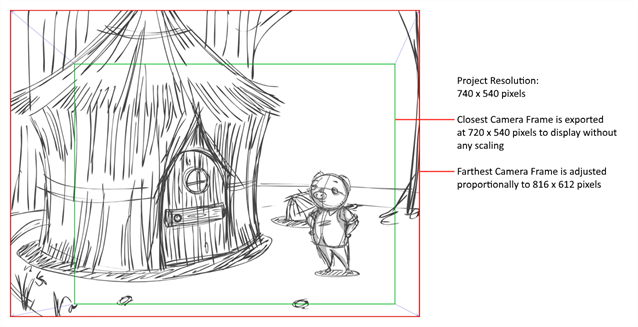 Resolution: Sets the resolution to be a quarter size, half size, or full size of the current storyboard resolution. Image Zoom Level: Sets the magnification of the image. Enter a value between 0 and 400. The default value is 85%. Transparent Background: This option is only available when the Adobe Photoshop (.psd) file format is selected. By default, this option is enabled and will export .psd files with a transparent background instead of an opaque white background. Print Camera Frame: Prints the camera frame onto the exported images. If a panel has a camera movement, a camera frame will be printed for the position of the camera at the beginning of the panel as well as for the position of the camera at the end of the panel. Print All Camera Frames: Prints a camera frame for each camera keyframe in the panel. Rectify Static Camera: If the camera is at an angle in a panel, and there is no camera movement in that panel, enabling this option will render the panel as if the camera was at a straight angle. Allow Camera Scaling: This option is enabled by default. This ensures that when a camera close-up is included in a scene, the exported image is larger so that the closest camera frame is at least the size of the chosen resolution. This way, the image will not appear pixelated when zooming in on the closest camera frame. If disabled, the exported images will be the size of the chosen resolution. Maintain Size Through Scene: Ensures that the elements from the exported panels retain their size across the different panels of the same scene. For example, when exporting a scene where the camera zooms in on a character through two different panels, this option will make it so the character is the same size in both exported images. In the same situation with this option unchecked, both bitmaps will be just big enough so that their closest camera frame is as big as the chosen export resolution. 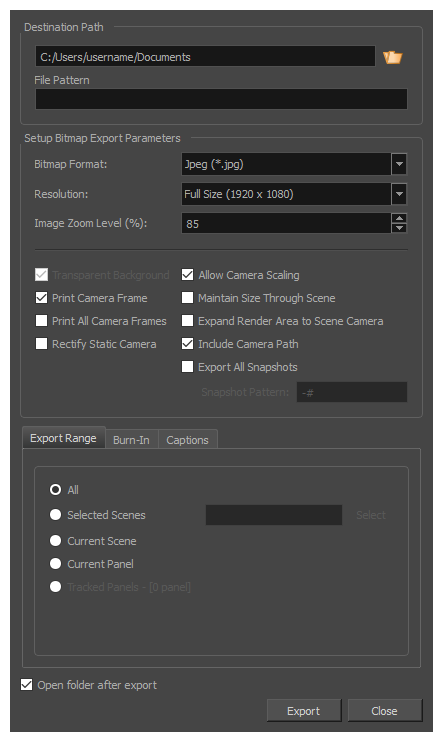 NOTE By default, exported bitmaps cannot be larger than 4096 x 4096 pixels, which might cause this option not to work as expected when exporting scenes with camera zooms. For information on how to change this setting, see Import/Export Preferences. Expand Render Area to Scene Camera: By default, exported panels only cover the area covered by the camera movements in the panel. With this option enabled, exported panels will cover the area covered by the camera movements in all the panels in their scene combined. That way, if all the exported panels in a scene are combined, the elements of the scene will all be in their proper position respective to each other. Include Camera Path: Ensures the exported images include all the areas covered by the camera movements. If this option is disabled, the exported images will cover the camera keyframes and everything in-between, but may not include parts of the panels that are covered by curvilinear camera movements. Export All Snapshots: If your project has a panel that contains several snapshots, by default, only the main snapshot in that panel will be exported. If this option is enabled, panels that contain several snapshots will be exported as several image files, one for each snapshot. NOTE To learn more about snapshots, see About Snapshots. Snapshot Pattern: When exporting all the snapshots in a panel that contains several snapshots, this field allows you to customize how the number of the snapshot is appended to the file name. The # symbol represents the number of the snapshot. Its default value is -#, which means that a dash followed by the snapshot number is appended to the file name. For example, if exporting panel 4 of scene 16, and that panel contains three snapshots, the exported bitmaps for that panel would be named MyProject-16-4-1.jpg, MyProject-16-4-2.jpg and MyProject-16-4-3.jpg. NOTE Only images for panels that contain several snapshots will have a snapshot number appended to their file name. Tracked Panels:Exports panels on which tracking changes is enabled—see About Track Changes. 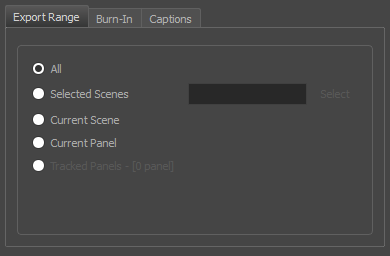 In the Burn-In tab, if you want to print the scene names and panel numbers onto the rendered images, check the Print Scene and Panel Numbers check-box. 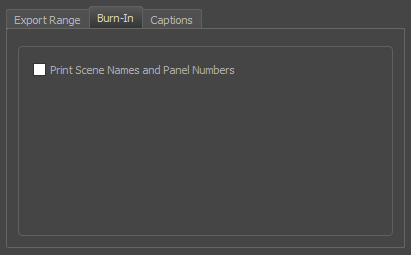 In the Captions tab, you can choose to print any of your storyboard’s captions into the exported bitmaps using the following options—see About Captions. Print Captions: Choose whether to not print captions (None) or select one of your project’s captions to print into the exported movies. By default, a Storyboard Pro project has Action Notes, Dialog, Slugging and Notes captions, but you can also choose to print custom captions if your project has any. 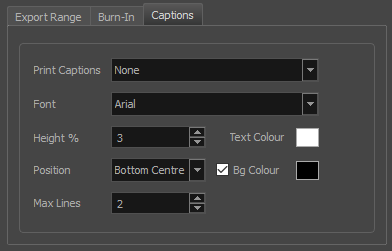 Font: Select which font the captions will be printed in. By default, they will be printed in Arial. Height %: Sets the size of caption lines relative to the height of the exported movies. For example, if exporting a movie at 1080p with 3% Height captions, each caption line will be 32 pixels in height. Position: Prints the captions at either the Top Left, Top Centre, Top Right, Bottom Left, Bottom Centre or Bottom Right of the movie. By default, captions are printed to the Bottom Centre. Max Lines: Sets the maximum amount of caption lines to print on each panel. If a caption being printed requires more than the maximum amount of lines, it will be cut off with an ellipsis (...) at the end. Note that even if captions are printed at the bottom, they will be aligned to the top of the space reserved for them, which is calculated by the amount of Max Lines x the Height %. Therefore, if this setting is too high and captions are printed at the bottom, they may appear closer to the middle of the picture than to the bottom. Text Colour: Select the font colour in which to print the captions. Bg Colour: Select the background colour on which to print the captions. If the checkbox is unchecked, the captions will be printed directly into the rendered picture. Otherwise, they will be printed in rectangular boxes of the chosen colour.